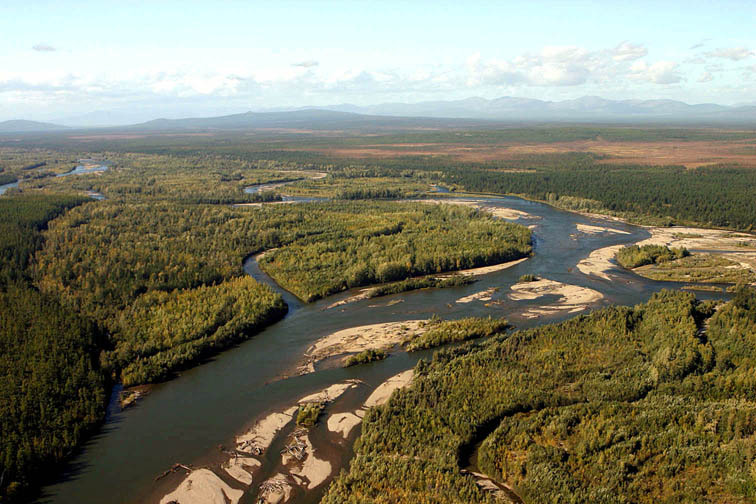 Brief info on the drainage Yama River is flowing into the northern part of the Sea of Okhotsk to the east from Magadan. 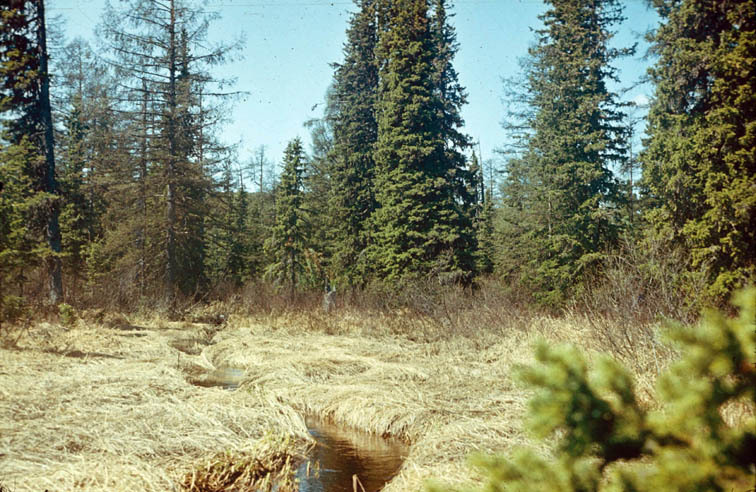 Its length is 315 km, and the watershed surface — 12500 sq. km. The drainage is not populated and not changed by the human activities. 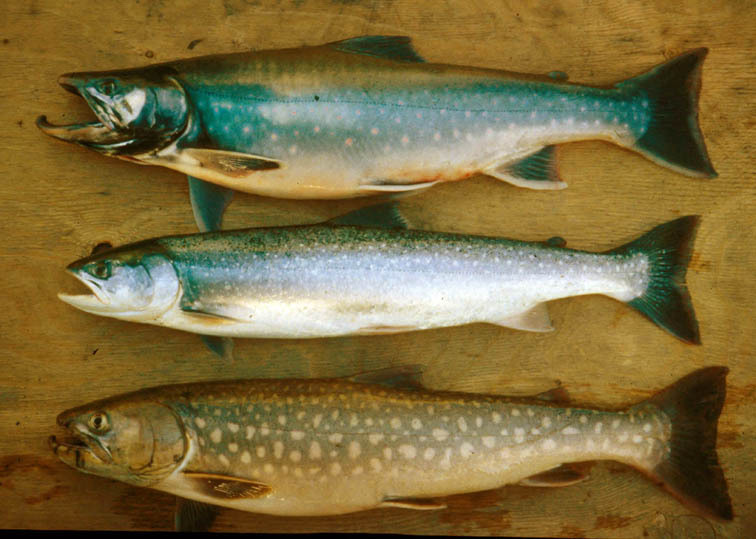 The diversity of Salmonids is high (7 species are spawning). These are pink, chum, sockeye, coho, and 3 species of anadromous chars! 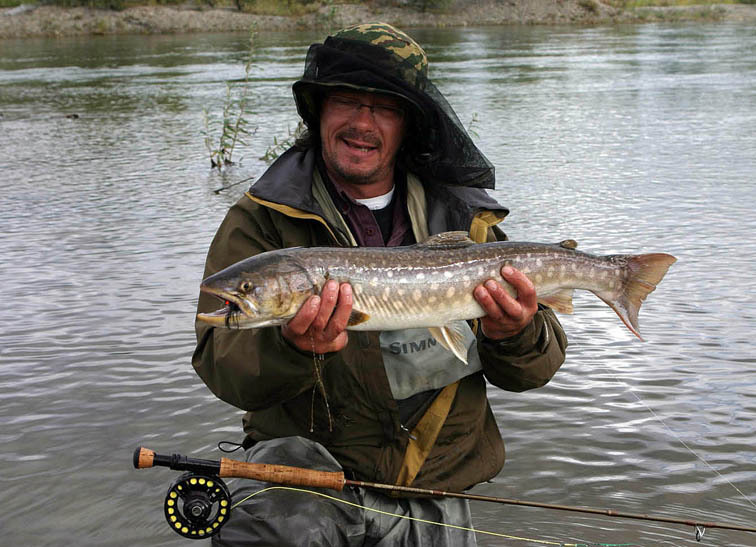 Among these chars are not only widely distributed Dolly Varden char and white-spotted char (kundzha) but also rare Levanidov’s char (yellowmouth char). 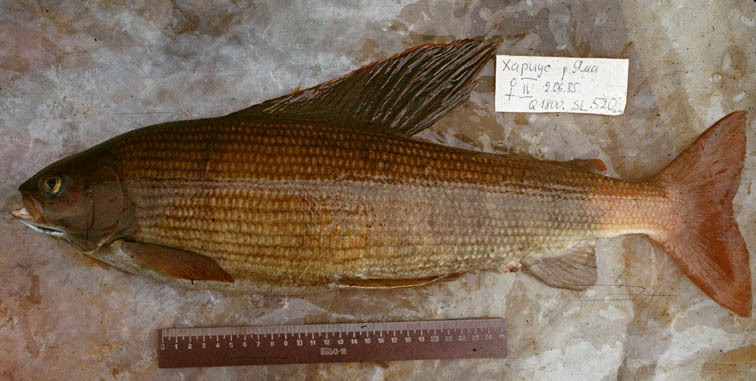 This species Salvelinis levanidovi was discovered in 1984. 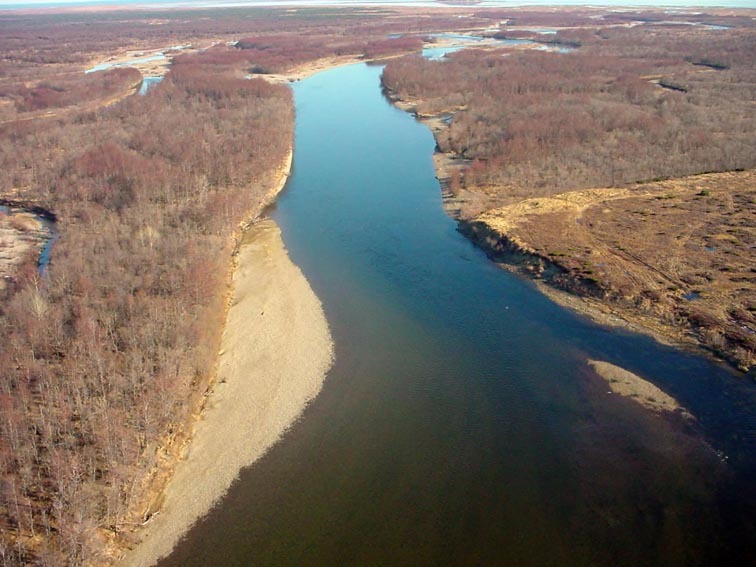 The key stretch of the river valley (45 km) is protected by the Magadanski Nature Preserve. 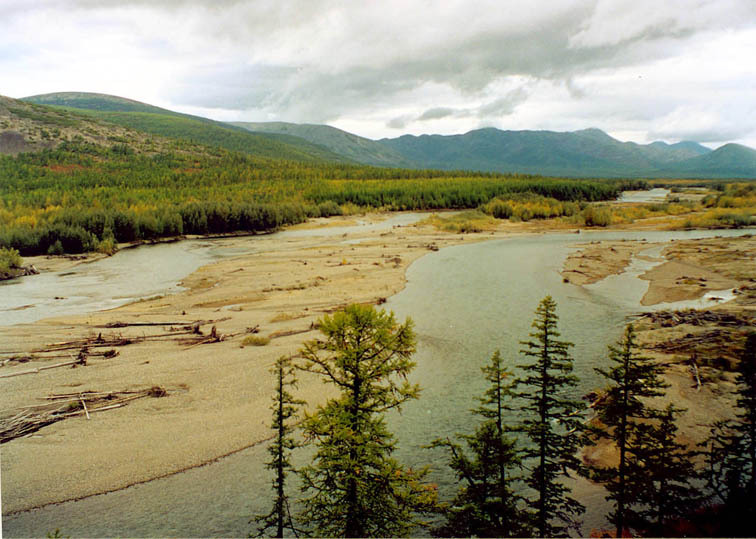 The sources of the Yama flow from the plateau where also some tributaries of the Kolyma River are beginning. 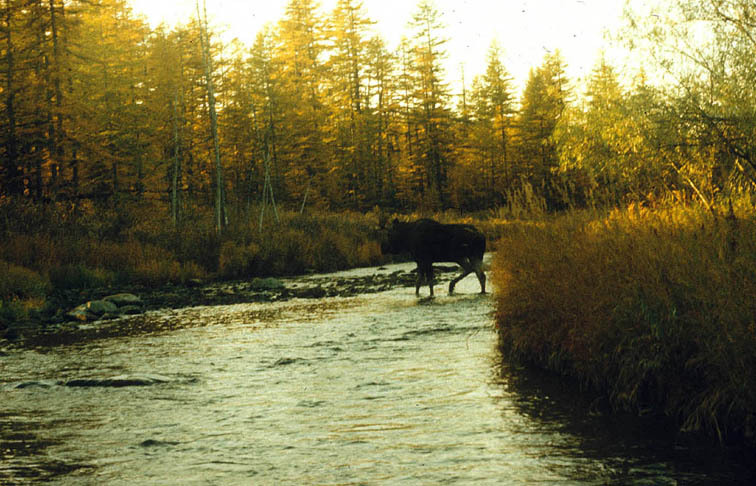 Moose crossing a creek Upper Yama, August. 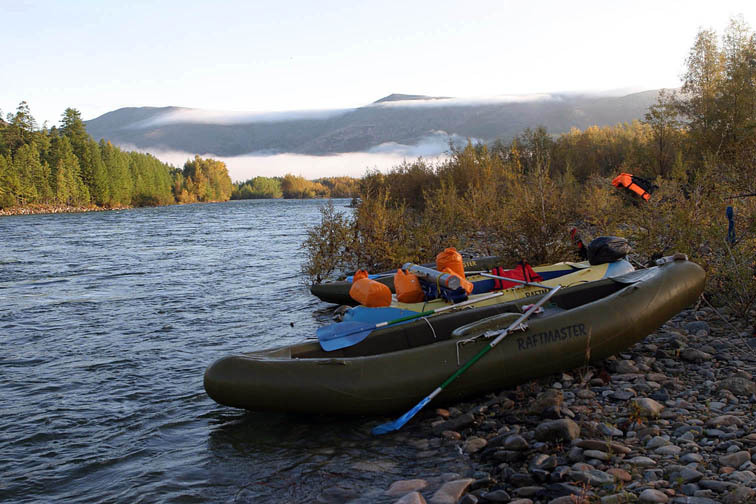 Floating is the most pleasant way to see the whole river. 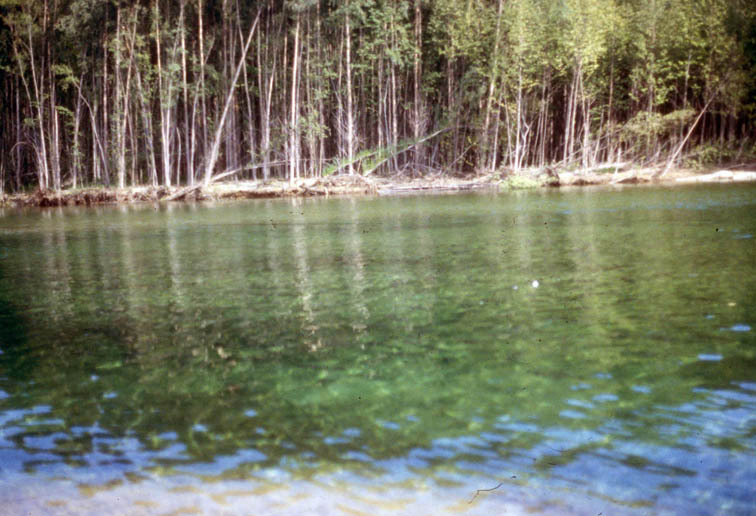 The middle reaches of the Yama near the mouth of dark-water Studenaya River. 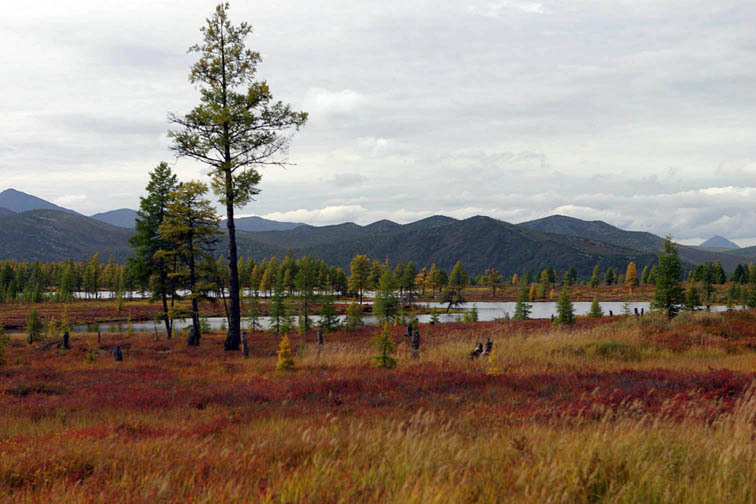 Yama River valley In the lower reaches of the Yama you can see some spruce — this is the only habitat of this tree in Magadan region. 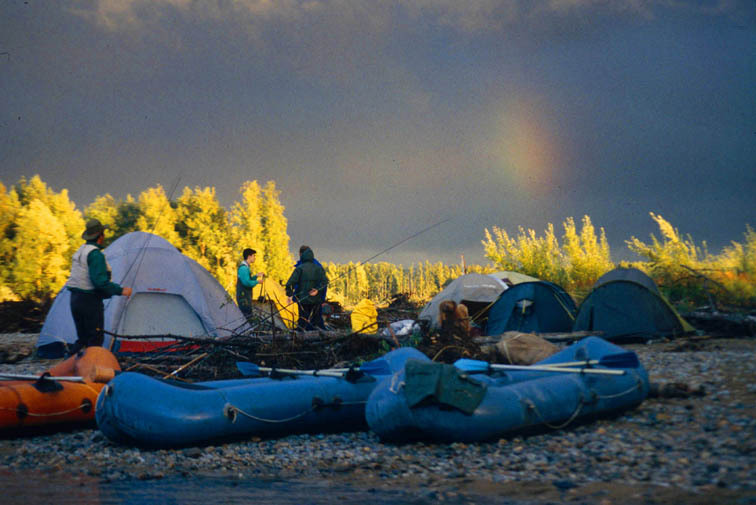 Fishing camp before the evening thunderstorm. 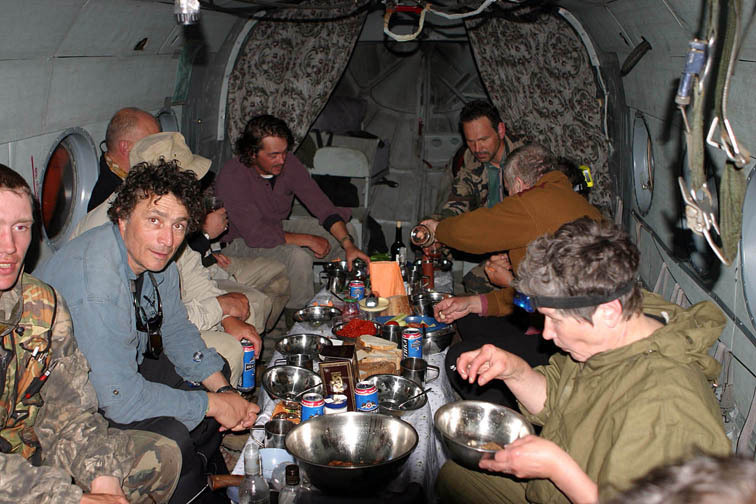 A group of French fishermen is having dinner in the helicopter. Tomorrow they will go back to Magadan and then home. It was long ago... 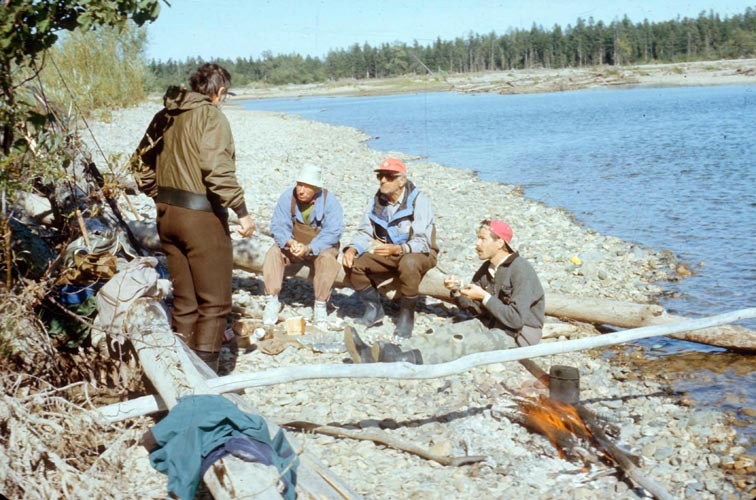 Lunch at the bank, German and Dutch fishermen,1994. 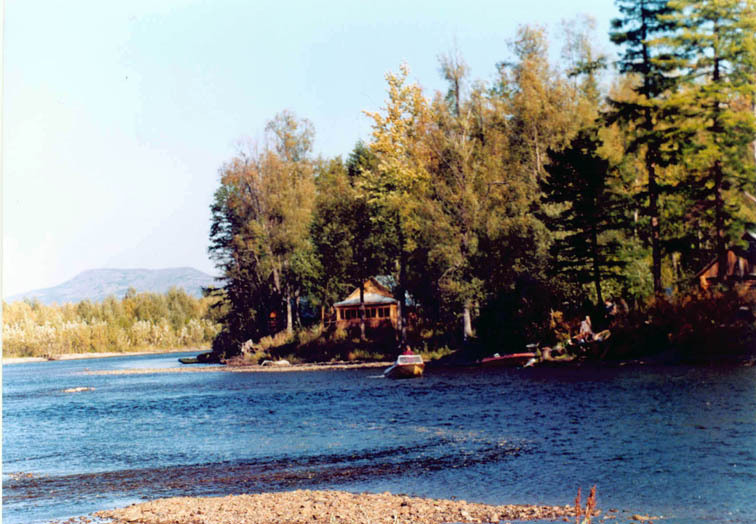 Fishing lodge at the mouth of the Studenaya River Lower part of the Yama, mid October. 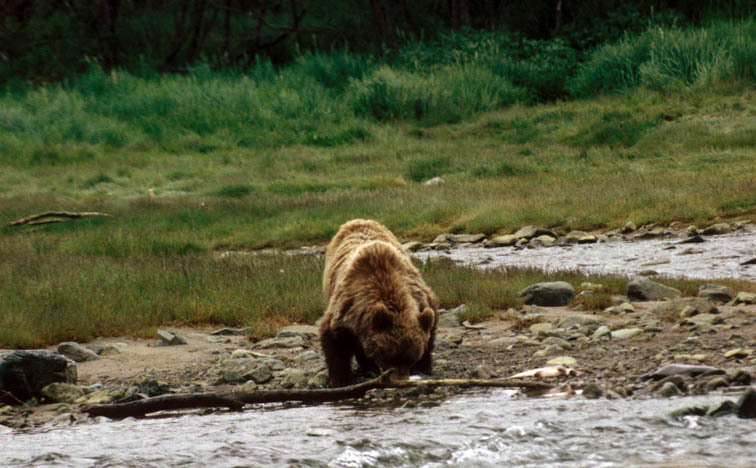 In July the bears some to salmon streams to fish In the Yama there 3 char species: Dolly Varden charr (top), Levanidov’s char, and whitespotted char (bottom) Yama is one of the streams where one can catch a trophy kundzha (whitespotted char) Arctic grayling from the Yama R. Can be very big! 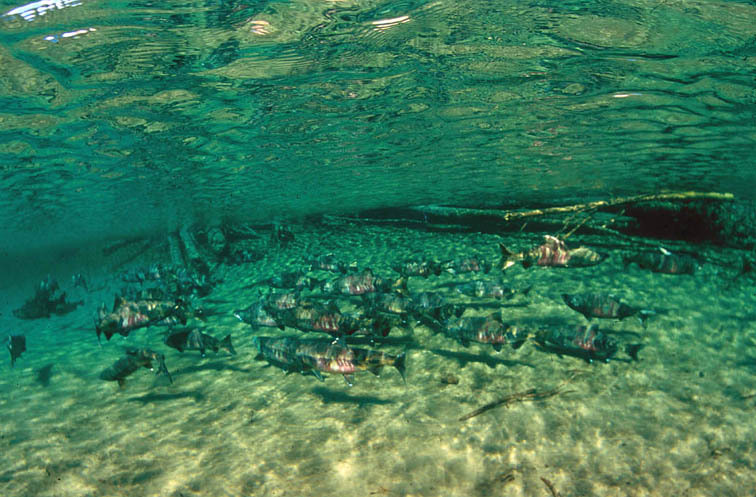 The most numerous salmon of the drainage is the chum. On some yours its runs number hundreds of thousands. 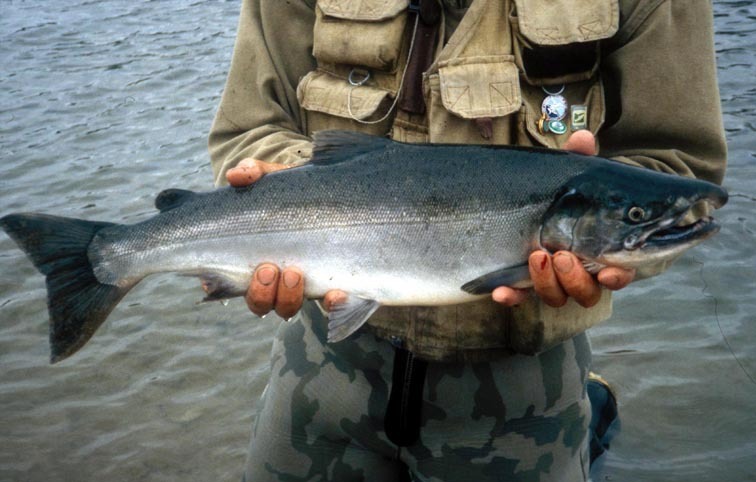 Silver male of coho salmon Coho is caught mostly with big, bright flies. 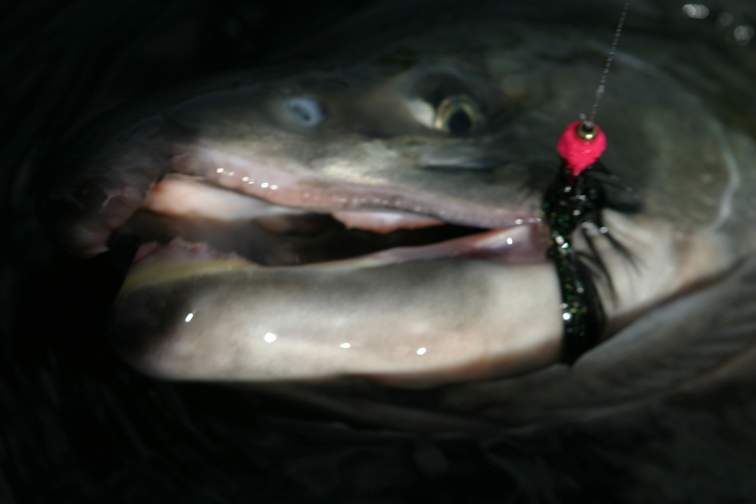 One of the best is the Egg Sucking Wooly Bugger on # 2 hook. 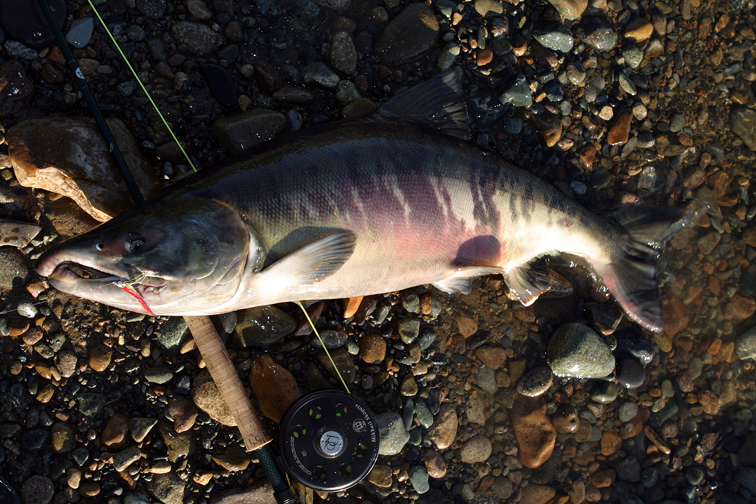 The beauty and the beast.. Coho salmon in spawning colors: this fish had spent in the fresh water not less than 3 weeks. 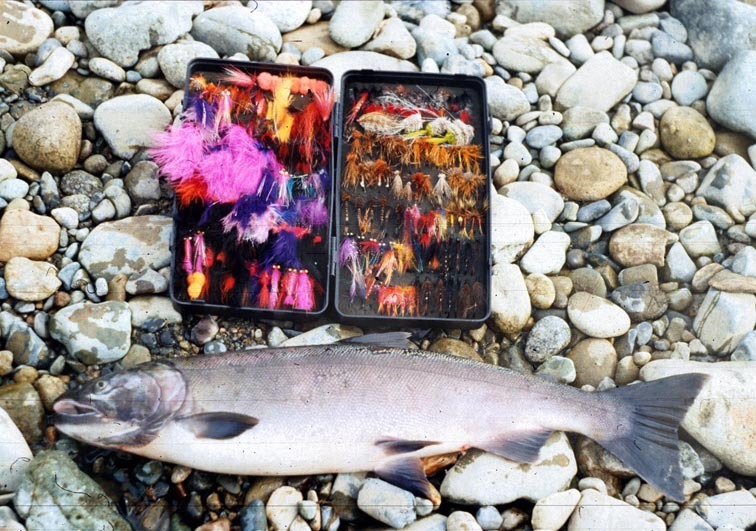 A typical fly box for an Pacific salmon river A side channel of the Yama, used by salmon for resting. 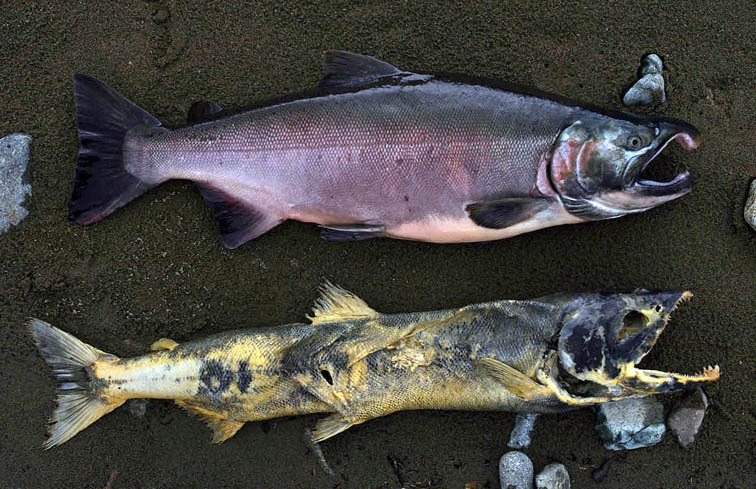 The fish looks like dark spots in green water. 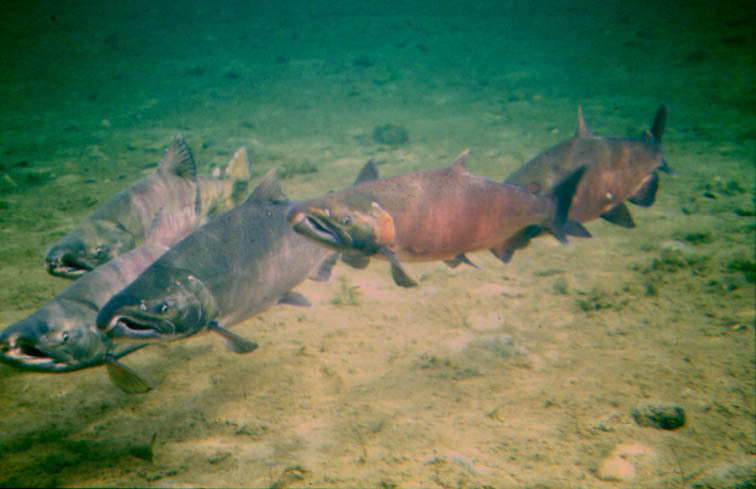 Three coho and two chum salmon move upstream in one school. 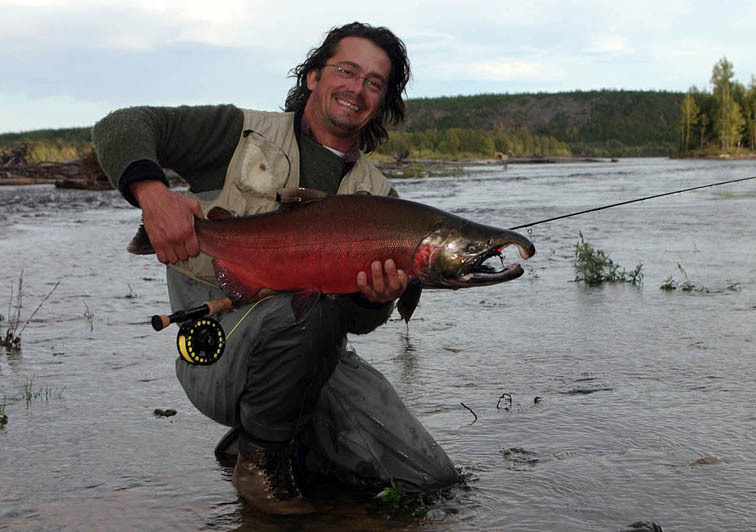 The water in the Yama can be extremely clear (author I.Uchuev, Magadan) Do you want to float and fish the Yama?